Posted: August 1st, 2011 under 6M, DX, Hamradio, Soundclips. This was surely one I didn't have much hope in working. I've barely been watching 6M at all in July. Seems I need to pay more attention. Especially when an expedition is on. I noticed that last week SM6CMU had managed to get them on 6M. I think also a few other SM stations made it in the log too. On Saturday, OH2MA managed to get them on 6M. To my surprise, I was alerted by LA8HGA that he was hearing ST0R late Sunday afternoon. Almost before I had turned on the radio, he had worked them. I heard them here, but they were not too strong, and they did have a pile-up. I tried calling, but I couldn't get through. The qsb took them, and I thought I missed them. Luckily, they were in and out of the noise several times. I still could not get through to them, and suddenly he sent QSY SSB. I really thought that was it. No way that I could get them now. Even more to my surprise, I heard him and he was stronger. 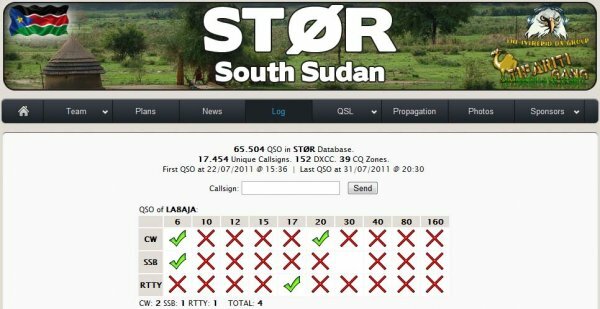 I worked ST0R on 6M SSB for #132 on 6M. And you know… after I worked him, the signal came up even more. It seemed like there were few takers and he went back to CW where I quickly worked him this time. I don't know what to say really. The band didn't seem to be very well open, but 6M proves again and again that it is the magic band. I'm sure we have more openings on the band than what we are aware of.